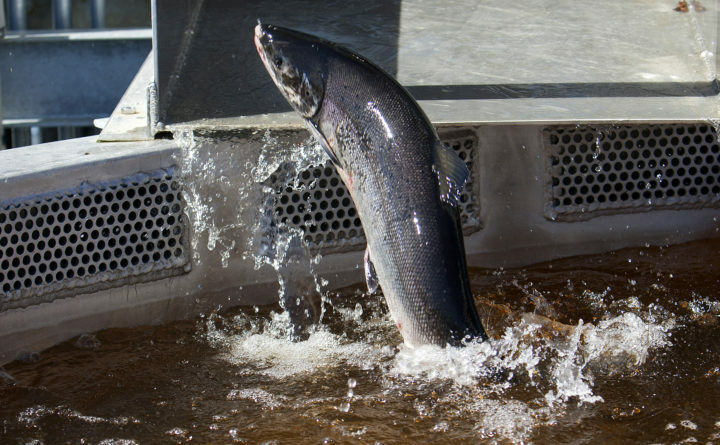 An Atlantic salmon makes its way to a holding tank at the Milford Dam fishway at Brookfield Energy in Milford June 24, 2015. Over the past few weeks, we’ve been writing a lot about striped bass. At first, those stories featured enthusiastic anglers on Maine’s Penobscot River, where a healthy run of stripers has provided some appreciated fishing opportunities this summer. Then, earlier this week, we told you about the situation in nearby New Brunswick, where a population explosion of stripers in the Miramichi River — a legendary Atlantic salmon fishing destination — has salmon camp owners quite concerned. Concerned enough, in fact, that they’ve petitioned their own federal government for help in the form of new regulations, including an unlimited bag limit on stripers longer than 50 cm that are caught in freshwater stretches of the river. That latest news from Canada was a bit of a surprise and got me thinking. The question I posed to Andy Goode, vice president of U.S. programs for the Atlantic Salmon Federation, was simple: Are U.S. salmon conservationists concerned about stripers in the Penobscot and other Maine rivers? Some background: The Penobscot has often been described as the last, best hope for Atlantic salmon restoration in the United States. While the salmon that return here every year are federally listed under the Endangered Species Act, hundreds do make the annual return trip to spawn in the river. As of July 23, a total of 734 salmon had been counted this year at the Milford Dam, which is also one of the most popular fishing spots on the river for land-based striper anglers. In fact, they’re often fishing within 200 feet of the fishway when they hook and fight a striper. That’s the same fishway the salmon use when they head upstream. So should we stop celebrating the sizable run of stripers in the Penobscot this year? Goode, for one, says we shouldn’t fret a bit. For more than a decade, as the Penobscot River Restoration Project worked to remove two dams on the river and provide fish passage at a third, Goode and other conservationists said that the effort would aid all fish, and a river-wide approach — rather than a species-specific one — was essential. So what makes Maine’s Penobscot different from the Miramichi? On the Penobscot, it turns out, the stripers are kind of like summer tourists. They stop by for a visit, and a meal or three. Eventually, they head back home. That’s because Maine’s rivers don’t have spawning populations of stripers. “[And] the northwest Miramichi has the only spawning population up in the Gulf of St. Lawrence as the flows, reach and chemistry seem to be just right, [and] stripers are homing back to that area each year,” Goode said. Picture those fish not as tourists, but as your (eventually) unwelcome cousin who shows up and stays with you for a couple of months, eating everything in the fridge. Including all of your Atlantic salmon. According to an ASF press release, salmon camp owners on the Miramichi estimate that there are 1 million stripers in the river right now. That factor, when combined with a reduction in the at-sea survival of salmon over the past 15 years, has led to a disaster on that Canadian river, Goode said. To put that number in perspective, consider this: Although anglers are catching stripers in the Penobscot River, only 772 have been counted at the Milford Dam. The Miramichi has seen a flood of stripers. The Penobscot has enjoyed a trickle. “[The Miramichi] is probably more vulnerable to the increase in stripers than it would be if [the run] was healthy,” Goode said. Stripers are also native to the Miramichi, but Goode hinted that the predator-prey relationship might be out of balance enough that governmental help is needed in Canada. That balance might eventually return without new regulations, but Goode said that timeframe is likely longer than salmon anglers are willing to endure. “Given the numbers, we have been supportive on increased [bag limits] by anglers and First Nation fisheries up in the Miramichi,” he said. John Holyoke can be reached at jholyoke@bangordailynews.com or 207-990-8214. Follow him on Twitter @JohnHolyoke.